Cute, Clean, Cozy & close to all! Discounted rates $25 off 2019 nightly rate ! You will love staying in this great location where 90% of the people are locals. They each have an interesting Key West tale to tell and are a warm, friendly and diverse group. Here you will absorb the ambiance that made Key West what it is today. Varela St Retreat is located in the historic Old Town section away from the hustle and bustle of noisy Duval St. 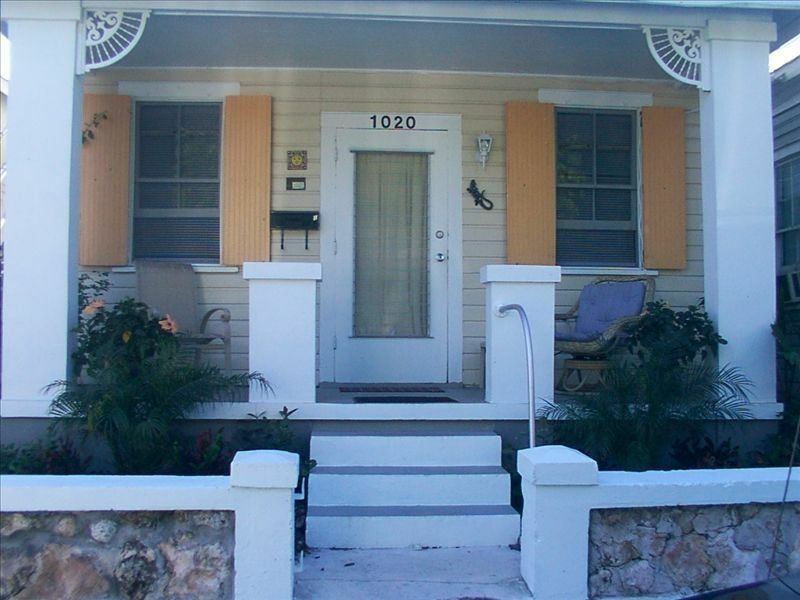 It is only 1/2 mile to the closest beach and a 7 minute walk to Duval the main street. It is less than 1 block to the White Street art gallery district, the grocery, laundry, shops, restaurants, park and more. Go ahead and kick your feet up and make yourself at home! You are about to enter Varela St Retreat. Here you will have your very own private full front porch to enjoy. It is a good place to eat, exchange local gossip or just plain curl up and read a good book. The apartment features a luxurious oversized shower, full kitchen, internet, cable and more. Marilyn has owned the home since 1981 and loves to welcome visitors from near and far to CeKey West. If you want to get the feel of what it's like to live in Key West and like to stay in a homey environment complete with kitchen, living area and either deck or front porch. This is a good match for you. It will accommodate 4 people but I think it works best for 2 adults simply because it is about 500 square feet. Central location with front porch. Located Old Town Key West, 6 blocks from Duval Street. 1/2 mile from Higgs beach. The Ocean is only 1/2 mile away and a nice walk. There is also a nice restaurant and pier on the beach. It is not visible from my place but very close by. Free street parking ONLY in designated areas. Bike rental shop located at the end of street not included. My place is only 1/2 from Higgs beach. It is a great location and is super close to Fausto's grocery and M and M laundry. It is also close to Bayview Park which has tennis courts. Nice quite location, easy walk to most areas, listing is accurate, had very nice time. Had a great time. Beautiful island lots of history and great food. Great place close bike ride to Duval street would stay here again! The property was just the right size for two adult sisters. The house was clean. We especially enjoyed reading on the front porch in the late evenings. Had all the items we needed for a weeks stay. Quiet, safe area. We enjoyed the area, just far enough away from the busy part of town. The neighbors are friendly and helpful with suggestions of restaurants and activities to do. I would suggest renting bikes, best way to get anywhere on the island. Very nice place. It was clean and comfortable, and everything you need is within walking distance or a bike ride. Restaurants, laundry, stores, Old town and New town. The owner went above and beyond to make sure everything was perfect for my stay. I will try and rent this home again if it's available when I go down again. Just as described - cute, clean, cozy, and close to all! My stay at this little house was enjoyable. It had all the basic amenities. Marilyn is easy to contact and does a great job providing all the details associated with the place. Although I would have felt more comfortable if there weren't so many rules listed in the information packet. For a small place, the shower and bathroom were large! The place is located perfectly for biking around the entire time and is only a few blocks away from restaurants and bars. There was plenty of parking spots near the place, so we were able to safely leave our car parked on the street and travel around by bike. The downside was the bike rack's location in a place where it was very difficult to maneuver 2 bikes in and out of over and over again. My place is in a very good location. There is a grocery store and laundry extremely close by and also a nice bike rental shop only 9 houses up at the end of my street. Additionally there is a tennis court and 2 parks close as well as many restaurants, shops, gas station, liquor store, and more. I am located in historic Old Town Key West. RATES LISTED ARE FOR THE LODGING PORTION ONLY AND ARE PLUS TAXES AND CLEANING FEES.